Welcome to Möja in the outer part of Stockholm archipelago. Möja island is situated 60 kilometers east of Stockholm City just were the middle archipelago ends and the outer isles, known as the most beatiful wilderness in the World, begins. Möja is one of the largest islands in the archipelago. The known history of the island goes back to the thirteenth century. Today the island has more than 200 inhabitants staying and living on the island all the year around. In the summertime the number of inhabitants is five times higher and the number of visitors counts in tens of thousands. You will find us 200 meters from Berg ferry-bridge. When you hire sea-kayaks from us you start your paddling in the most fantastic part of the archipelago. You are just 20 minutes from "The Möja natural reserve" where you can paddle for days on the boarder to the outer isles, but still on waters protected by hundreds of small islands. In the small islands you can put up your tent and stay for the night. If you are an experienced paddler you can, in half a day, reach the legendary outer isles i the Nassa and Gillöga archipelagos. If you don´t bring camping equipement you can stay in bed and breakfast on Möja. 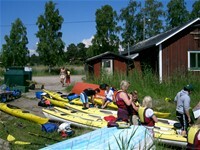 Prices for kayaking, ferrie timetables etc are included in this website, but only in swedish. Only Three hours kayaking from Moja we have the most spectular "seal-spot" in the archipelago. Nine Days out of ten they can be seen if the wind is not to strong. They are are used to our kayaks and they are interested. There are good oppurtunities to put up your tent and spend the night 20 minutes from the seal-spot.